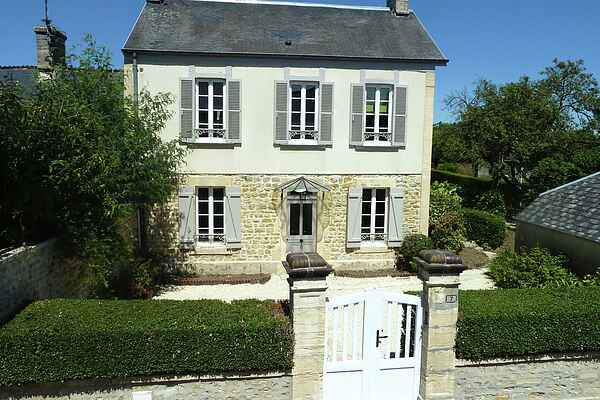 Let us surprise you with this stylish holiday home at just 1.5 km from the Celtic town of Bayeux. You can reach the sandy beach in Asnelles within fifteen minutes. After a lovely day at the beach, you can enjoy a delicious drink in the garden, in the sun or under the umbrella. In short, the ideal place for a varied holiday. Do you like fishing? Cast your fishing rod in the river Seulles (9 km). You'll often see old watermills along the rivers here. Spend a day at the beach in Courseulles (20 km) where you can also go sailing and surfing. We're talking about the beaches where the allies landed on June 6, 1944 to liberate Europe. Visit the impressive museums in Caen (27 km) or closer to home in Bayeux. Here you will find a museum with a 70 m long, medieval tapestry that portrays the invasion of England in 1066 as a cartoon. Upon entering your holiday home you will immediately see the elegant staircase. In the evening it's cozy to have a drink in front of the fireplace.